My list of "Equal Opportunity Breads" still waits for more items to be checked off - I did some more, but got a bit listless after a few stubborn loaves just didn't turn out the way I liked. But in a recent weekend edition of "The Guardian", master baker Dan Lepard published an interesting bread made with whey instead of water. From my last batch of Greek yogurt I had a lot of whey left over, sitting in my fridge, while I wondered what to do with it. Dan Lepard cooked fresh butternut squash for his puree, but here in the US good quality canned pumpkin is readily available, and preparing and draining pumpkin puree a time consuming process. I always have a supply of pumpkin puree in my pantry (to satisfy a sudden craving for pumpkin pancakes or pumpkin chocolate chip muffins). But for those who don't (or prefer making their own), here is a link to the procedure. Dan Lepard's formula you find HERE. really speed things up and with commercial yeast in the mix - go into overdrive! Love the color and crust of the bread very much. Very Thanksgiving...ish - Something that isn't too far off ! I'm guessing these would make a nice dinner roll too like Floyd's pumpkin bread? So, did you notice an extra tang to this bread or was it too sweet to notice? Yes, DBM, I knew your apprentice would approve of the seeds! I didn't notice an extra tang, and the bread isn't sweet, either. I'm sure the dough would make great rolls, too, and next I will try this with half of it. Dan Lepard's bread was lighter in color than mine, not so golden, perhaps because he used fresh pumpkin. 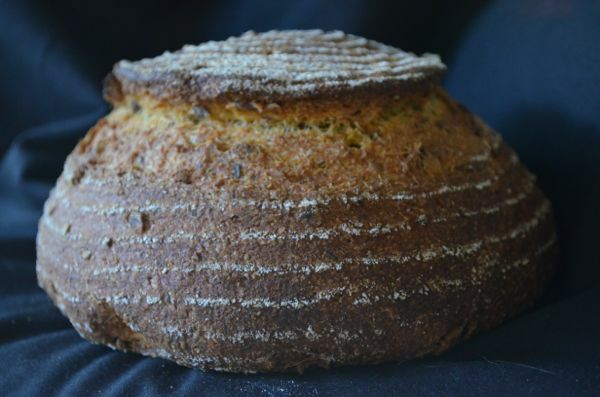 I was quite smitten with the looks of my bread, and will definitely make it again, perhaps even for sale. Looks beautiful Karen. So how much of the pumpkin do you taste? Thanks, Ian. 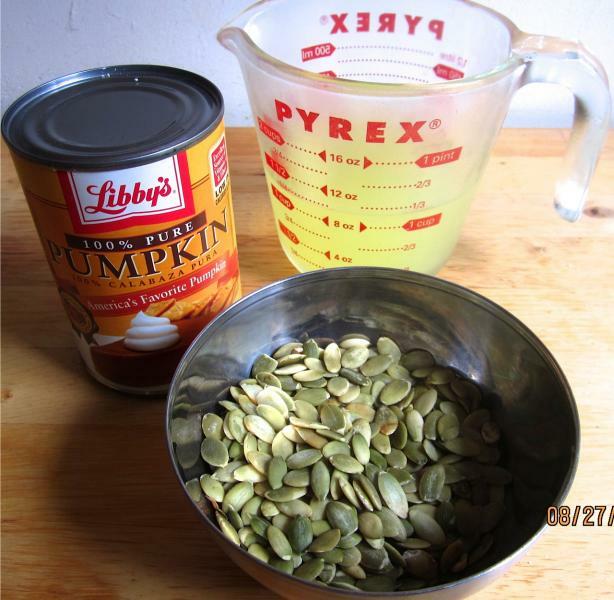 There was no distinct pumpkin taste, more from the toasted pumpkin seeds. I would describe the taste as mellow and well rounded. 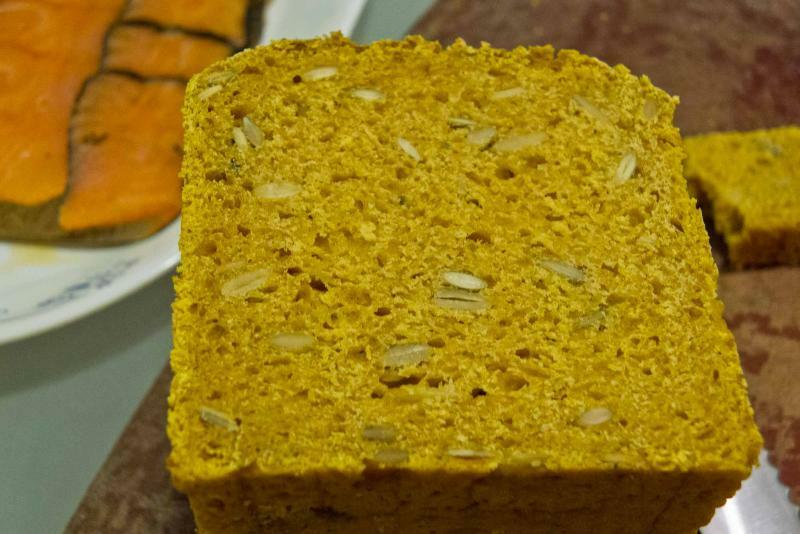 I make another kind of Austrian pumpkin bread, with spices, and there the pumpkin flavor is more pronounced, thanks to the cinnamon and ginger, but that is a very different bread. 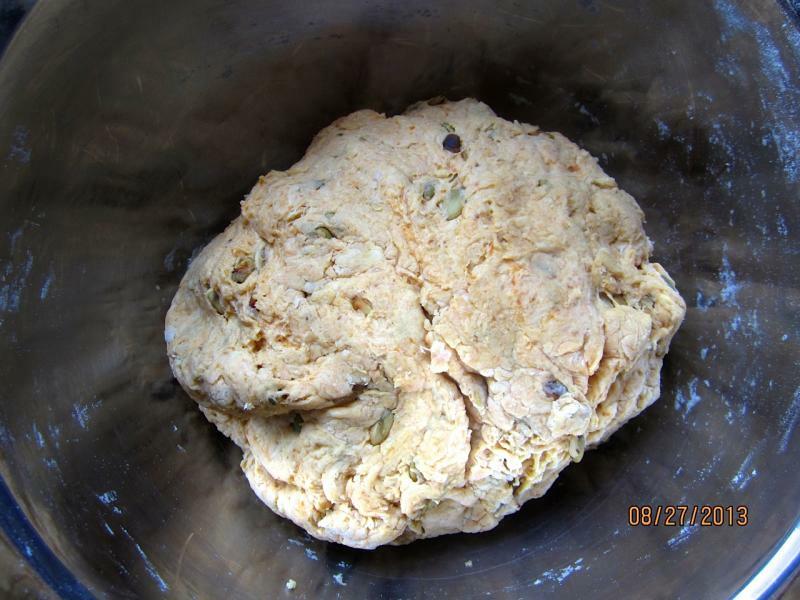 I always heard that whey could be used instead of the water in breads, and, when I had some whey from yogurt making, I sometimes randomly threw it into a dough I was preparing, but without a plan, and more to do something with it. Absolutely, this bread is definitely Thanksgiving-worthy. No, you couldn't taste the whey, it just added moisture, and and softened a bit, like potato water. But, as you can imagine, the thrifty housewife in me rejoiced to utilize the by-product of my yogurt making. We have a golden fall here in Maine, my little apple tree has 2 (two!) apples, and the cats don't give up on chasing the squirrels that mock them. Today was the day I baked this loaf of yours. I loved working with the dough. Very nice to shape in the morning after being in the refrig. overnight. I used canned sweet potatoes instead of pumpkin and added a bit of maple syrup too….couldn't resist. Thanks so much for the inspiration. This is a loaf that will be baked again and again around here. Sorry, not crumb shot, it was given to one of my 'regulars', but I loved the color of the crust! Such nice loaf! I was thinking of trying it with sweet potato, too, but my last trial at Greek yogurt, for some obscure reason, ended up with a soured milk, and no separation. Either I dilute this or have to wait. I hate it when a soft cheese, yogurt or buttermilk/sour cream culture doesn't work as I expected. Were you using a dry culture for the yogurt or using some of your left over yogurt? Beautiful! Would you mind if I featured this for a bit? how could I mind, I'm flattered. 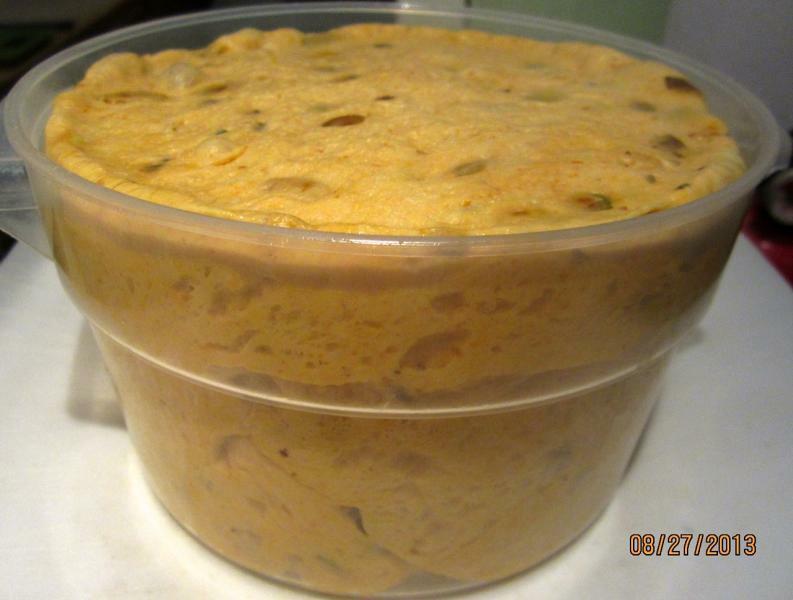 Very good use of whey and pumpkin puree, Karin. What a beautiful and flavorful loaf! I like how your post starts with a photo of the finished bread, and shows what it looked like later on, just before it went in the oven. The colour from the pumpkin screams at you....to be eaten and enjoyed, of course. Do you make your own yoghurt? A regular source of whey surely means you have your own bread improver always on hand! 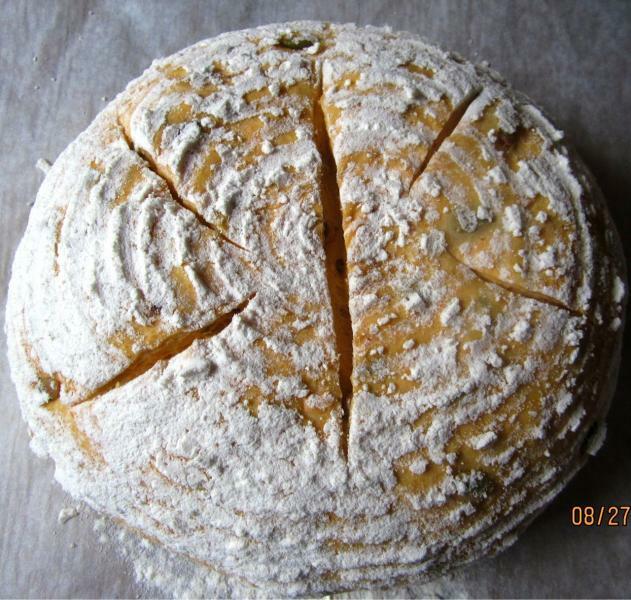 Combine the whey and moisture from the pumpkin puree and the bread should keep fresh for a good few days. And pumpkins will soon be here in abundance; so I should try something like this myself. I sometimes make Greek yogurt, and haven't given up on trying to make quark, so I often have whey in the fridge. The bread kept, indeed, very well, I had it in a brown paper bag, and, after three days, it was almost like freshly baked. Please, do try it, it's really worth the effort. Have you tried using beer moats to get the snails? Just dig some wholes to fit a plastic cup where the lid is at the surface of the ground. Fill the cup 1/2 way with cheap beer. They go for it and drown. Helped my garden out without having to use any chemicals a few years back. Kinda gross and you gotta dump the cup from time to time. 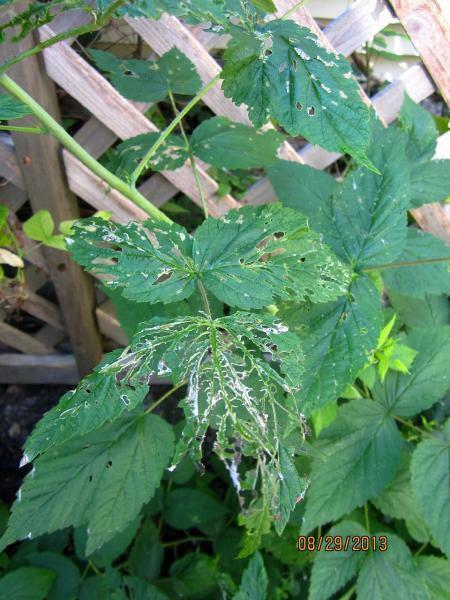 But it draws them away from your plants. Diotamaceuas sp??? earth also is said to work well. These "laces" were perpetrated by beetles, but slugs devoured our hostas and other plants. I heard of that method, but never tried it, so far. I will definitely follow your advice! I found those slugs even in broad daylight, munching away, but during the night there must have been legions of others. good job. Wish you could just fax me a slice for breaky. I bet your homemade yogurt tastes amazing - as must this bread. Thanks for sharing your creative way of using ingredients. I'll must try Marcus' seedy bread, too. We find the homemade Greek yogurt as good, or better, than what we can buy, and it's fairly easy to make. Perfect for much anticipated Fall weather. I've post marked this one for a to do! Thanks for the nice write-up on this one and Congratulations on another beauty of a front page post. Do try it, Sylvia. I enjoy writing my posts, and try to make them a bit entertaining, too. Thanks for this hanseata. I haven't baked for a very long time, but recently my father who lives around the corner from me just harvested several good-sized pumpkins from his backyard, and I was wondering what to do with it besides making a pie. I should try to make a pumpkin bread, a real bread, not a dessert or pie.. Thank you for this post. 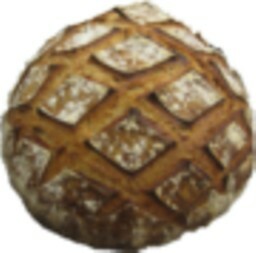 This is such a nice bread, it's really worth it. I'm not the greatest fan of pumpkin pie, and prefer "neutral" breads that you can eat with anything, too. I can't take my eyes off the golden crumb, it looks so attractive! I'm going to give this bread a try. Thank you for sharing! It really does. 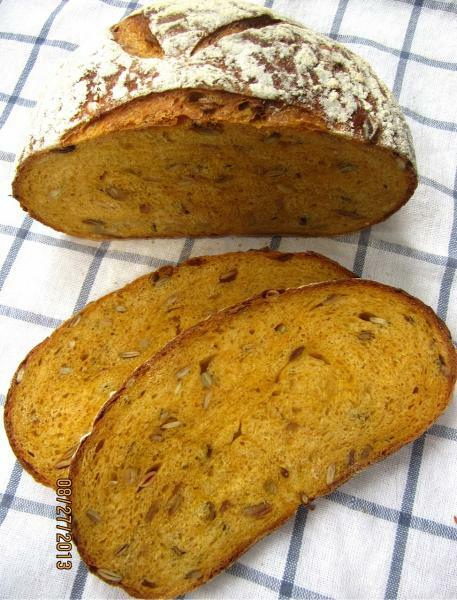 With canned pumpkin puree the color is a bit deeper golden than with home cooked, Lepard's bread is much lighter. Please, let me know how you like it, if you try it. I'm using Libby's as well. Further decrease the yeast to 3g; 10% white whole wheat; and 6% agave nectar. Just loaded the dough in two Pullmans, approximately 1100g each. They are being retarded at 36F until.....I haven't used dry yeast for a long, long time, so am not sure about the timing; but I'll watch the dough closely and find a time when both me and the dough are ready. I will definitely keep you posted of the outcome. If I'm baking this in a Pullman, what temperature and time would you use? Is 425F x 40 minutes, as stated in the formula, still good? Unfortunately I don't have any experience with Pullman pans, I don't own one. Unless somebody else can give you a better advice, I would try it out. Good luck! What a beautiful loaf, Karin! What a beautiful loaf, Karin! I think pumpkin rolls are going to replace sweet potato rolls at my house this fall. Great post! I want to try the rolls version, too. Did you take whole wheat? The loaves look very good. Do you have a crumb shot, too? I did not have a chance to cut my bread until today, one week after it was made, as I had to go on a business trip last week. It's been left in room temperature for seven days and surprisingly it's still quite moist. Next time when I make this bread again with commercial yeast, I think I'd better use some fresh one as the one I used had been frozen for a few years and it didn't seem very potent. but I can imagine the pumpkin kept it from drying too much. I usually freeze what I can't eat within three days. The crumb looks fine to me, I never tried to freeze yeast, I keep it in the fridge. With my little home-based bakery I go through it pretty fast, even though I use only small amounts in my breads.